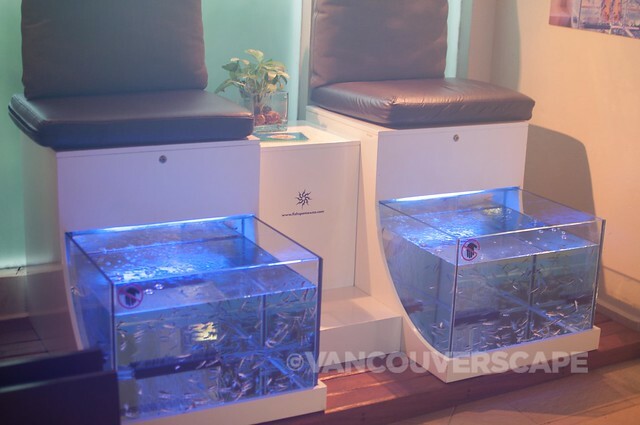 One of the most popular – and peculiar – treatments available at Secrets Silversands Spa by Pevonia is a Fish Pedicure. The session begins with a brief warm foot soak and wash by one of the spa practitioners, to make sure no toxic substances enter the fish tank. The Garra Rufa belongs to the carp family and is found mostly in Kangal, Turkey. They’ve been used for centuries in both Asia and Turkey for healing benefits. The minnow-like fish average in size from 3/4″ to 1 3/4″ and can grow up to 2 3/4″ as an adult. Getting nibbled by these fish promise a natural exfoliation during a typical 25-minute session with your feet about ankle-high in a water tank. The fish nibble (no teeth) away at your feet’s dead and damaged skin – a strangely natural instinct for them. Calluses, eczema, and psoriasis have been treated with this ‘unique’ therapy. 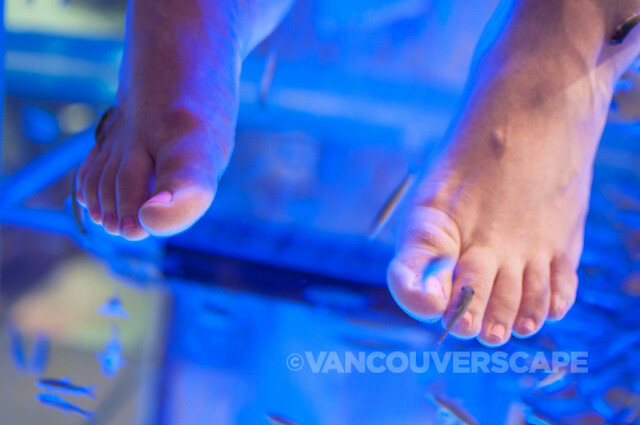 Though both my husband and me felt smooth, relaxed feet following the fish feast, the little colony of fish definitely preferred my tootsies. The feeling was a tad odd at first, but after about five minutes, you’re used to the motion and nibbling. Once in a while, the fish would go under my feet for a nibble – I’m ticklish so I’d just move my foot and they’d find a new spot to enjoy. I was worried that the fish might eat away at my nail polish, but they showed no interest in picking away at my pretty pink toenails. Thinking back on the experience, we still found it pretty remarkable that these fish are drawn to human feet in the first place. I’m not sure whether placing a hand in the tank would get them nibbling there as well, but the ‘keep hands out’ sign was enough to let us keep guessing. 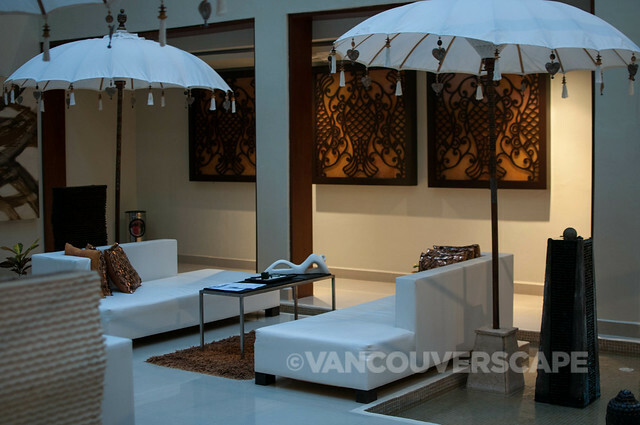 The treatment is followed by a short, relaxing foot massage in a little thatched palapa outside the spa. 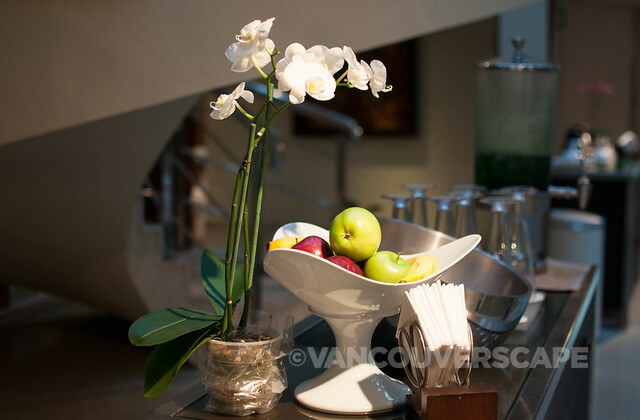 The 25-minute session costs $69 USD per person. Reservations are required. Our massages were courtesy of Secrets Silversands Resort. Opinions, as always, are our own.